The MINI Cooper is a two-door four-passenger coupe. The MINI Cooper is to England what the Volkswagen Beetle is to North America – an icon. This small subcompact coupe first arrived in England in 1959 and arrived in the US in the 1960s. The vehicle disappeared from the market in the late 1960s as MINI couldn't keep up with the emission regulations in the US. The vehicle reappeared in 2002 and immediate success. It was given the 2002 North American Car of the Year award. Part of the MINI’s success is its ability to appeal to a wide audience. This vehicle always represented a fun way to drive. 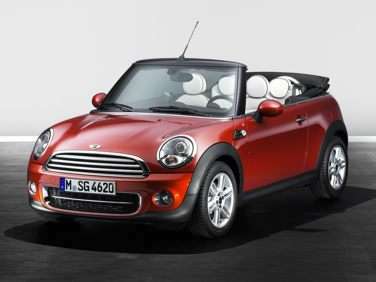 If you like convertibles, then the MINI has one for you. It offers the joy of open air driving with a canvas top that can be lowered in 15 seconds. Another advantage of the MINI Cooper is that older models tend to retain their value, making these cars good investments. The MINI is a great vehicle offering great value. You can load it with options and upgrades, but the basic package delivers a lot of car at an affordable price. It’s hard to find a subcompact hatchback or convertible for the same money. The current MINI Cooper was overhauled in 2007. The new front end offers more space for two fuel-efficient 1.6 liter four cylinder engines. This front end was also reshaped to be more pedestrian-friendly in case of accidents. The base model engine offers 118 horsepower with 114 pounds feet of torque. In the Cooper S, there is a turbocharged, direct-injected engine offering 172 horsepower with 177 lb-ft of torque. The engine is paired with either manual or automatic transmission. The car is bigger and longer than the previous version. This two-door four passenger coupe has a larger interior with a large central pod that stores the audio system controls, and a tilt wheel that now telescopes. There are even cup holders that hold real cups. There is loads of comfortable seating room, given it’s class, and the controls are easy to read and to use. Standard with the basic MINI Cooper are front fog lights, vehicle speed proportional power steering, air conditioning, font power windows with 2 express, remote keyless power locks and windows, trip computer that can show average speed and average fuel consumption, vinyl seats, and a full audio system with AM/FM radio, CD player, 6 speakers and diversity antenna. Safety features on the MINI Cooper include intelligent driver front airbags, intelligent passenger front air bags, front side airbag with occupant sensors, 4 disc brakes, four-wheel ABS, and theft protection alarm. Also standard are 3-point seat belts for all positions w/belt stopper, pyrotechnic belt tightener, belt limiter and ISOFIX child seat attachments with two rear anchorages. Crash sensors cutoff fuel, activate hazard lights & interior lights, and unlock doors. In the crash test ratings, the 2009 MINI Cooper rated five stars in both the rollover resistance rating and the driver side impact crash test ratings. For all other crash tests, the vehicle rated four stars. The bottom line is this little car has a lot of heart. It is fun to drive, easy to handle, smooth on the cornering, all of which delivers a load of driver satisfaction. The 2009 MINI Cooper has had several changes made to it since the 2008 model year. Among those is the absence of the convertible version. It will not be made this year but will come back again in a later model year in a redesigned version. The 2009 MINI Coopers that are being made have a more powerful engine, new interior and exterior styling and upgraded brakes. All MINIs now have stability control as a standard safety feature. There are three MINI trim levels: the John Cooper Works, the Cooper and the Cooper S. The Cooper comes standard with a 1.6-liter engine with four cylinders, 118 horsepower and 114 pounds of torque. There is a turbocharged engine in the Cooper S that has 172 horsepower and produces 177 pounds of torque. The John Cooper Works trim level has an upgraded turbocharged engine that has 208 horsepower and has 192 pounds of torque. Each trim level has six-speed manual transmission standard. There is an optional manual control shift available for the Cooper and Cooper S trim levels. The base trim level has 15-inch wheels made from alloy, power accessories, premium vinyl upholstery that feels like leather, a trip computer, air-conditioning, a tilt and telescoping steering wheel wrapped in leather, a CD player, a stereo system with six speakers, an auxiliary jack for audio and a Sport steering setting. The Cooper S trim has 16-inch wheels, sport seats, a turbocharged engine and a tighter suspension system. The John Cooper Works trim has 17-inch wheels, a turbocharged engine that is more powerful and brakes that have been upgraded with Brembo calipers. The John Cooper Works also has a few small styling detail changes here and there inside and out. There is an optional audio system with 10 speakers that is available for all trim levels.